This is a spinning top with my usual design with a recessed tip, which can spin for almost one hour when it is spun by multiple twirls. The flywheel is made of copper. The wooden parts are made of snakewood. Diameter mm 60, weight 332 grams. I used opals for the decorative ring of the top; it is the first time I use this expensive material, it is very nice, it is partially transparent and has reflections with different colors, from green to blue, sometimes even orange. The appearence of these opals changes depending on the light, if the light is scattered the brightness and color of the opals are more uniform, when the light is direct instead, isolated bright reflections of different colors become evident, as you can see in the video. The sequences of the video with close-ups of the opals were made in direct sunlight, which best reveals the beauty of these gemstones. The last sequence too was made in direct sunlight, with quite closed diaphragm, to simulate the night, while maintaining the bright reflections of the opals. I made a case for this top. Usually I don't make cases, but this was requested from the owner of the top. I used leadwood for the case, a very dense, hard, and stable wood. The lower parts of the case are made with Delrin. 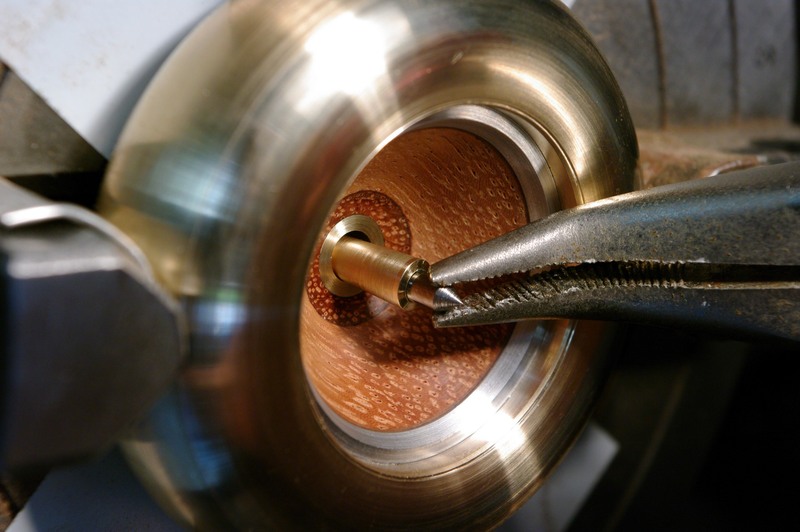 I never used Delrin before, and I can say that it is a fantastic material to turn on the lathe, it turns easily, and it can be sanded and polished and the quality of the finish is good. Above all I used Delrin because it is a very suitable material for making the thread of the screw closing of the case. In the past I used aluminum for the aim but Delrin is better because it is a smoother material and the action of closing is more comfortable, while with the aluminum thread instead there is a slight tendency to get stuck, nothing serious, but aluminum on aluminum doesn't slide so well. The inside of the case is covered with a black carpet. The tip of the top is easily replaceable. There is a taper joint and the tip is simply press fit into the top. This top can be used with a HSS tip or with a carbide tip. The carbide tip allows for longer spins, up to almost one hour. With the HSS tip there is less wear and longer duration of the contact points. Normally I use a HSS tip in tops like this, I use the carbide one only when I want longest spins. When the tip becomes weared out, it can be resharpened, so that, even after many years, it is possible to restore the tip, and the top will spin perfectly again, like a new one. In tops like this, also, the balance can be fine tuned. I am very finicky about balance, a well balanced top is beautiful to see while it spins. Also, a well balanced top is more suitable for to observe the behaviour of a spinning top, trying to understand the physics which rules its movements. I like to think about the physics of spinning tops, I made a few videos about and I will make others in the future. I developed a method for to balance accurately my tops. This method requires some time, patience, and some manual skills, so it is not suitable for persons feeling not to have them. I teach the method to the persons interested in my tops. Also I described it in two or three of my older videos. the movement in the fluid, (water), you saw is caused by convections. There is a container full of water and a stove under it. When the water in the bottom, near the stove, becomes warmer, it expands a little, it becomes lighter, (less dense), so it rises afloat, while at the sides of the container the water, colder and more dense, sinks down. You don't see these movements in transparent water but if you add something in the water the convection become visible. In the first sequence I added mica to the water, (silver color powder), mica sinks slowly in the water, so if the convection is fast enough, the water lifts the mica and makes the convection visible. In the other two sequences, you can see the side view of the top, and a view from above of the container with the water behind the top. 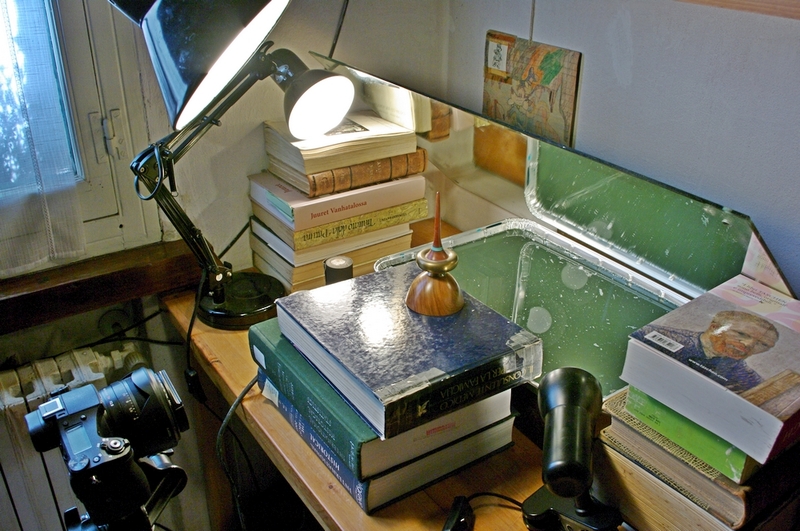 The trick is possible thanks to a 45° tilted mirror behind the top. When I was using a brush in the video, I was removing some dust from this mirror. Here I used a water soluble brown mordant, very diluted in the water. The reddish areas in the video are reflections of light from the bottom of the container, through this brown but still partly transparent water. Then I added some acrylic color diluted in water, at the sides of the container. This color is heavier than water so it sinks down. Here the color is sucked towards the center of the container, where there is an upwards motion of the water because of the hot stove under the container in that area. When the color reaches the central area it moves upwards together with the water, it comes afloat, and at this point it becomes visible as a clear expanding spot. The water at the surface is pushed outwards so the flow of water is reversed here, (the water in the bottom is sucked towards the center of the container). When this water reaches the sides of the container, it sinks, and the cycle starts again. By the time, the color becomes more and more mixed with the water, as you can see in the last sequence. I tried using alcohol instead of water. Alcohol expands more rapidly than water so even the mild warmth of a hand is sufficient to cause spectacular convection in a glass of alcohol held in one hand. I preferred water because the convection currents are larger, which I liked more, aesthetically. Water, compared to other liquids, has a quite low coefficient of thermal expansion. At very low temperature it even reverses behaviour, so that very cold water floats instead of to sink down. So ice, for example in a lake, or a bucket, starts to form at the top, not at the bottom. The other liquids are different and they start to solidify at the bottom, where the colder part of the liquid collects. Water has an atypical behaviour; it shrinks and becomes denser while it cools, it is densest, (heaviest), at 4 °C, but then, below 4 °C, it expands and becomes lighter again. When a cold wind cools down the surface of a lake, the cooled water sinks, and the convections spread the cooling down in the water. But below 4°C the superficial water doesn't sink anymore, convections tend to stop, and, if the air continues to cool down the surface of the water to 0 °C and less, ice will form there. The land of Leonardo and Michelangelo, gave top spinning another MASTER! So much detail and art put on the top! And then again on the video! I'm honored to be on the waiting list for one of your creations. There were a few other persons interested before you, but I didn't hear from them anymore, so the next top will be the your. I will contact you in February. Spin tops not the truth. The top is amazing and the video effect is too!! !